The 6th & 7th; Smashed. — In one of the stars I shall be living. The 6th of July. I must have done something terrible in a past life. I am currently on my third attempt at backing up my phone after I dropped it on the bathroom floor and the screen cracked in innumerable places. It has landed there many times and finally my luck has run out. Smashed. Day started off okay. Hospital this morning for bloods before venoplasty. There was literally nobody in the waiting room which was very disturbing, like a horror film. Thankfully nobody had been murdered, it was just quiet. Trish gave me a stab in the elbow, then I asked about having the PICC dressing changed and the nurse who was around wasn't signed off on that. She had to get Nicola to come and supervise, then they couldn't find the butterfly dressing, then they found the last one in the treatment room. Thankfully we did get it done without the line coming out or being shoved too far in. Phew. To town! Mommy was having an eye test, and I needed to go to John Lewis because the jacket I bought last week is now on sale for £37 less than I paid, and as they are never knowingly undersold, I was after some money back. The lady on the till was fine with this, she just had to corroborate my story and was happy to put the cash back on my card. Hooray! Then I went to Piccadilly and waited for Mommy to finish her eye test. Had a chat with Jenny about frames but all the ones I looked at were wrong for me. Can't change mine anyway, they are iconic. Mommy appeared, and Jenny got busy frame-finding. She's so good, she knows exactly what they have and what will suit you. We settled on some soft rainbow Volte-Face ones, now the horrible wait for new specs! At least it is not me, I get so antsy. 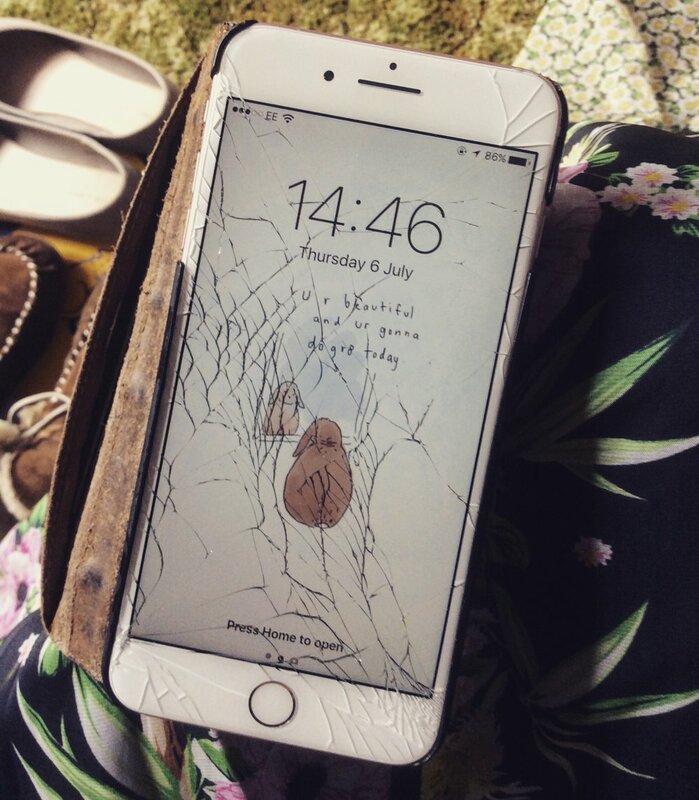 Got home, ate lunch, phone smashed. Since then, been at the iMac trying to back up the phone. This is my last go, then I'm going to throw myself off the roof if it doesn't work. My back is not going to thank me. I was up until past midnight trying to back up my phone to no avail, and the computer chair is not comfortable. I then spent most of my afternoon either in the wheelchair or the car, so all of that combined is probably going to mean pain tomorrow. When I got up, the last backup hadn't worked, so I tried just syncing it, and I went downstairs to have breakfast and stuff, before going back to see what I could try next. However, when I returned, it had done a successful backup! I don't really understand how, but frankly, I don't care. I had my appointment at the Stormfront shop at 2.20, but when I got there, the chap said they couldn't fix it in store; they'd have to send it off for 7-10 days. Um, no. My only option was to see if any slots had become available at other stores. Birmingham was a bust - next Friday. But Solihull had one at 3.40, so I took it and we got back in the car. Over at the Touchwood Centre, I checked in with one of the iPad people, then was waiting for my turn when I saw a face I recognised - it was Stuart Yeadon, who I have not seen for about ten years. I had no idea he was back in town, so when it was my turn, he came to take my phone and we had a wee catch-up. He said they could just get it done by the end of the day, so we had to go bimble until 5.45. This meant I spent money. I bought two crochet books and some pants and socks from John Lewis, a Krispy Kreme, and a jumper that was half price from French Connection. We also had a chat with Christine after her dentist appointment, and eventually it was time for us to go back. All had been fine, only the screen had been replaced, so none of the backup stress was necessary! Still, I am just happy to have it back.